Growing up vegetables around our house were usually the same – potatoes, corn or peas. Now that I am cooking all the time, I love trying new-to-me recipes that incorporate some of my favorite vegetables. Carrots are one of those veggies that I have always had raw but in the last couple of years I have enjoyed roasting them and adding different flavors. I can honestly say I have never thought of using ranch dressing mix on them. So when I saw this recipe doing just that I was intrigued. It definitely gave the dish a unique flavor and one that went well with our dinner. I’m looking forward to trying this on other vegetables. 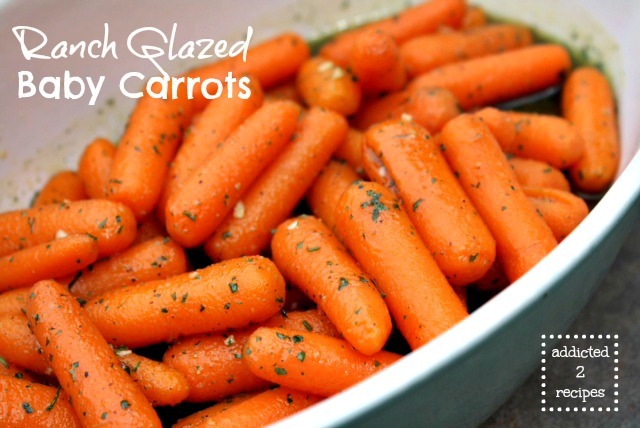 Prepare carrots by adding them to a saucepan with enough water to cover carrots. Bring water to a boil. Reduce heat, cover and cook for 5-7 minutes. Remove from heat and drain carrots. Place carrots in a separate bowl. Using the same saucepan, add butter and brown sugar. Heat until melted, mixing continually. Remove from heat and add carrots and ranch dressing mix. Toss to coat.